This entry was posted in Liberty and tagged Colin Kaepernick, Free Speech, Jim Wright. Bookmark the permalink. Yeah, the political stuff is boring. My issue is more direct: with Teddy out, might Colin be available. I’d say it’s Sanchez or Kaepernick as the best potential replacements that may be available (not sure if the 49ers would trade him). It does seem like “Veterans for Kaepernick” is getting a lot of positive press his way. But really, all that is noise, what matters is what happens during the game! Yeah, the political stuff is boring. It does seem like “Veterans for Kaepernick” is getting a lot of positive press his way. I will say that choosing to sit for the Anthem is better form of protest than shutting down I35. Fixed that for you, no charge. 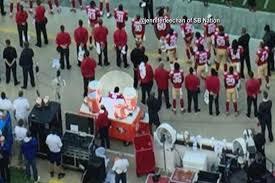 I wonder if Kaepernick’s adoptive parents echoed King Lear’s plaint about a thankless child and a serpent’s tooth? Be careful about adoption, or all you’ll get is spite, disrespect, and betrayal of the things you value. Look what became of Kaepernick. What a horrible brat. Those poor parents of his. They and this country gave him everything: opportunity, wealth and fame beyond the dreams of ordinary men. Sure, no place is perfect, but is there a better place to be a man like him? And yet he spits on it for the stupidest reasons, while of course forsaking none of its benefits. No gratitude, appreciation, humility, or filial piety. I bet he doesn’t even pay the favor forward and save a child like him from the ‘oppressed’ ghetto. I know his parents tried to cultivate his character, tried to instill these virtues within him. But it didn’t take, because there was always going to be this social force pulling his spirit away. Nothing one can do about that; it is just the way things are. Kaepernick is what happens; beware. Well said Mr. Thales. Entitled spoiled little cry-baby, another entitled liberal who wants to get paid for doing nothing, and like so many other “Fair Share” Liberals has to get his sense of significance not from a job, but from a perception of victimhood trying to draw attention away from his incompetence. I’m sure liberals have a nice cozy little safe room complete with cookies and puppies awaiting him when he gets laughed out of the NFL – that or he can look forward to enjoying the CFL or Arena League. .
To be fair, playing football at the highest level isn’t “doing nothing”, but only by technology created by people far smarter and less handsomely paid than he, is he able to leverage that to absurd levels of wealth. That he is such a ingrate is testimony not only to his stupidity as a human, but the moral bankruptcy of the media and academia that push the Narrative. Not to split hairs, but I don’t knock the fact that he’s made it to the level of NFL quarterback. What I knock that way are his “accomplishments” once he’s arrived there. “stupidity as a human”, “moral bankruptcy of the media and academia” – totally agree. Oh my — the Clevenger suspension revealed how hypocritical the sports industry is: free speech for black players, but not for white ones.